Basic signage sends a message. A well-designed space delivers meaning. It is easy for signage to become just another element contributing to the visual clutter of the world, but a strategic design approach will ensure a client's message doesn't get lost. Beyond the graphic design and placement of a sign, a designer can offer insight on the best way to communicate an idea and create a meaningful experience for the intended audience. "A successful environmental branding project is one that carefully considers the relationship between the individuals, the lighting, the acoustics, the colours, the signage and the materials," says Claude Auchu, lg2 Partner and CEO. "Beyond affixing logos and other graphic elements in the space, environmental branding means creating an experience for consumers that is anchored in the brand’s DNA, that represents its personality and values and that is a tangible expression of who the brand is. If we can still recognize the brand after removing all logos and be sure that no other brand can appropriate the space, we know that the project is a success." For the Viral Arcade & Lounge project, Iliana Sergeev RGD (IS Design Labs) employed strategic signage design to convey the feeling of action and energy associated with the client's virtual reality offering. "The colour palette relates to outer-space adventures and infuses the physical space with an electric feel," she explains. "While large posters advertise the space on the outside to passers-by, the inside of the space submerges the players into the theme." The team at A+A Design also prioritized the importance of atmosphere in their work for the Toronto Birth Centre. "We worked with the project architects, LGA Architectural Partners, to create wall and window graphics that provided atmosphere, privacy and a sense of place for this indigenous-run centre used by all Toronto midwives," explains Debbie Adams RGD, Principal at A+A Design. "The goal was to create a contemporary sensibility that communicated a sense of serenity and calm. The wall graphics were all interpretations of trees, from simple, abstract vertical gradient bands of colour evoking trunks and simplified tree forms, to a photo-mural birch forest and a wall embedded with twigs." Project: Toronto Birth Centre, A+A Design / Photo Credit: Ben Rahn of A-Frame Inc.
Enforcing the brand identity through all elements of the space requires a strategic perspective, which the team at DUFFY & Partners prioritizes through every decision that needs to be made. "In the context of environmental branding, ensuring that all choices made are “on brand” is what sets one environment apart from the rest," says Joseph Duffy. "What materials would make sense for the brand to use? Could you simply remove the logo and put someone else’s logo in its place? Does the brand have a toolbox full of parts and pieces to bring it to life across all the necessary environmental applications? Or do we need to create more visual elements to ensure a holistic expression?" Equally as important as the actual branding is the design decision-making process that helps determine when signage is necessary and when another solution can achieve the desired effect. 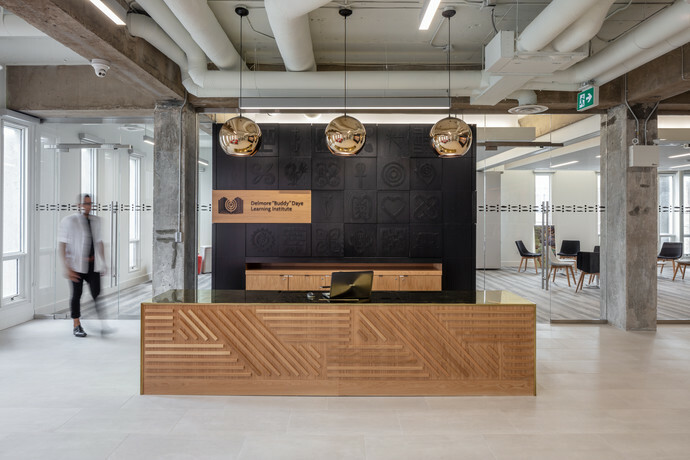 "When involved early in a new project, an Environmental Graphic Design (EGD) team can offer knowledgable advice and insight on where signage is most meaningful and when other design elements can be used," explains John deWolf RGD, Vice President of Form:Media. "I would rather work with an architect, landscape architect and urban planner to change the built environment, than just place signs in an existing space." This approach was applied in the signage program for Trinity College in Hartford, Connecticut, where environmental elements were used to reduce speed in lieu of regulatory speed control signage. "Planting trees with low canopies and realigning the orientation of on-street parking helped to mitigate scenarios of excessive speed," says deWolf. For the Delmore “Buddy” Daye Learning Institute (DBDLI), the client hired Ekistics Planning & Design with sister company Form:Media to develop a commercial interior for their office building. "The client's requirement for this project was a new space for staff and a community outreach centre," explains deWolf, "But we saw a greater potential to develop an environment that embodied a culture." The non-profit organization assists learners of African ancestry in Nova Scotia, identifying and addressing gaps and equity issues through research, publication and education. The design of the space incorporates adinkra symbols, visual representations aphorisms that originated in the Ashanti kingdom (what is Ghana today), to help tell a story and establish meaning. "Each officer chose an adinkra symbol that felt meaningful to their role, and the panels are removable should positions change over time." A+A created visual identity and branding, environmental graphics and signage and wayfinding for the Toronto Birth Centre, a birthing centre for midwives that started as a pilot project of the Ontario Government. The centre is run by an indigenous midwives organization, Seventh Generation Midwives Toronto, and the interior spaces took their inspiration from nature. The logo is based on moon cycles and the signage incorporates the rounded font, curves and circular forms from the brand into their design system. Birth Room signs were named after native Ontario trees and displayed silhouettes of those trees on the signs. Photo Credit: Debbie Adams RGD, Adams + Associates Design Consultants Inc.
Click here to read more from RGD's Environmental Branding series. Debbie graduated with honours from the Ontario College of Art & Design (OCAD) in 1983. Following employment with two top Toronto design firms, Burton Kramer Associates and Spencer Francey Peters, she established the partnership of Adams/Bhandari in 1987 and her own firm, Adams + Associates Design Consultants (A+A) Inc in 1988. She has acted as principal, creative director and designer at A+A for over 20 years, overseeing and creating award-winning design communications for a full spectrum of clients. Claude has been named one of the top 15 creative directors in Canada, one of the top 10 personalities of the year in Quebec by Infopresse and has been a member of multiple prestigious international juries, including the Cannes Lions Festival, the CLIO Awards and the London International Awards, in addition to chairing the jury for Canada's two largest design competitions. In 2006, he joined lg2 as a founding partner and creative director of the design studio. Since then, the studio has become one of the most respected and rewarded in Canada, winning more than 400 national and international prizes. It was also named Canada’s Design Studio of the Year in 2017. Form:Media is a interdisciplinary studio, based in Dartmouth, Nova Scotia. With sister company Ekistics Planning & Design, the integrated studio of architects, landscape architects, urban designers, planners, graphic designers, interpretive planners and brand experts sees beyond the traditional silos of discipline and collaborate to create meaningful engaging, and evocative built environments. Joseph Duffy, DUFFY & Partners. Joseph was born into the design business—literally. He has learned from some of the world’s most talented creative people and set out to follow in his father’s footsteps from day one. Joseph is charged with bringing brilliant creative opportunities to the Duffy team as well as being the keeper of the Duffy brand. Joseph’s work has been recognized for design excellence by: American Institute of Graphic Arts, Communication Arts, Print, Graphis and numerous other publications and organizations. He also travels around the country speaking to design organizations and schools and often judges design competitions and award shows. Michael is a product of Ontario College of Art & Design’s respected graphic design program. He co-founded the experimental design studio AmoebaCorp in 1996 and in 2013 came together with other highly respected industry contemporaries to create a refreshing new multi-tooled design led agency Jacknife. Throughout his professional career, Mike has brought his unique brand of creative craftsmanship and leadership to major projects for the likes of Nike, Molson Coors, Maple Leaf Sports & Entertainment, Red Bull, Second Cup, Hudson’s Bay, Weston and Nestlé. An advocate of designing with purpose, he believes that good design is the meaningful bridge between functionality and human experience, intuition with inarguable reason. Iliana has spent the last 10 years in the design industry working with international brands all around the world to bring ideas into reality and creating multi-sensory experiences. She is passionate about finding creative ways to interconnect brands and spaces strategically by uniting them through consistent brand storytelling - signage, poster series, murals, statement walls, installations. Field Trip & Co is a Toronto-based creative studio that works collaboratively to build thoughtfully crafted, compelling brand stories, across multiple disciplines and platforms. Carolina has worked as a designer in Sweden, Vancouver and New York. She spent six years as a senior designer at Bruce Mau Design in Toronto and led Designholmen for seven years, before Launching Field Trip & Co. Alison is a Toronto-based creative director with over 20 years of global and national design, advertising and digital experience. Through the course of her award-winning career, Alison’s work has spanned various industries including automotive, retail, consumer-packaged goods, professional services, telecommunications and not-for-profit. Hans Thiessen is the Creative Director of Design at Rethink. He throws curveball ideas, sweats the details and eats a bowl of laughs for breakfast. Over the past decade, Hans has helped ambitious clients achieve success including IKEA, Uber, Nike, EA, Molson Coors, WestJet, Shaw, A&W, CBC, Canada Skateboard and The One Club among many others. Hans’ work has been recognized with over 100 national and international awards, including the prestigious D&AD Black Pencil. Jessica holds a Bachelor of Design in Graphic Design from OCADU. After graduation, Jessica worked for several graphic design firms, including over six years at multi-disciplinary design firm DIALOG. Jessica’s journey to FORREC has led her to channel her knowledge of design, branding, advertising, marketing, digital, and environmental graphic design to create material for many different clients across multiple sectors including inspiring companies such as UNICEF Canada, Plan Canada, Kids Help Phone and CAMH.